The 1x1 Pavilion is a temporary wooden installation built to facilitate a diverse program of architecture-related events connected to the Faculty of Architecture STU in Bratislava. The winning competition proposal designed by student Michal Rachela was realized last month in collaboration with architect Katarina Bohacova and artist Bohus Kubinsky. The entire structure was built from pallets organized as four upside-down pyramids. The project 1×1, which will be housed at the pavilion, was initiated in winter 2010 as a pilot program launched by the Faculty of Architecture STU in Bratislava. The concept was to create a platform for discussion and debate within the discipline; a series of events will include lectures by leading European architects, discussions on current topics in architecture, and workshops and internships in renowned architectural offices. The pavilion will aid the effort to commercialize activities of the Faculty of Architecture by becoming a space for collaborative practicing of architecture, a great hangout place for students and a cultural venue. 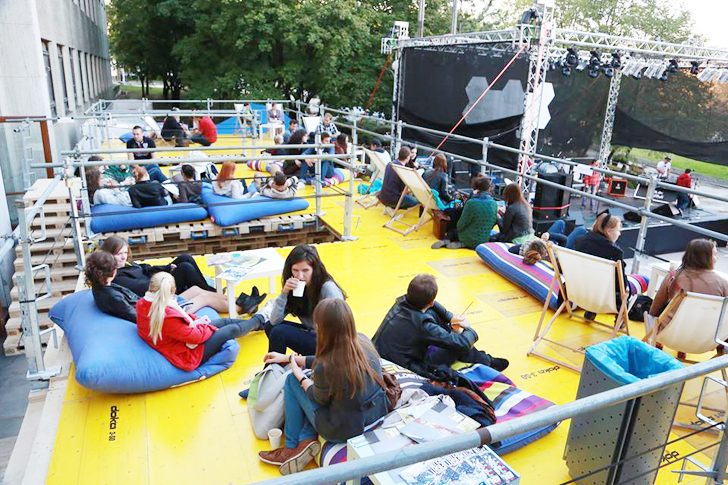 The structure was inaugurated at the music festival on 24 September, 2013. 1x1 pavilion is a temporary intervention that was led from first layout up to realization in 1:1 scale by architect Katarina Bohacova and artist Bohus Kubinsky from Faculty architecture STU in Bratislava. The genesis of the project has begun one year ago with first talks between Katka and Bohus about efemeral architecture and the demand of renascence of communication between Faculty of architecture and Square of Freedom. These ideas were projected to mutual collaboration and creation of layout for subject \"Fine art in architecture\" in 4th year of FA. As a result of semestral work was a competition, where among 25 projects were 4 prizes and won a project by student Michal Rachela. The concept leans on two basic levels - theory with prax and students with public. The shape of four upside-down pyramids constructed from europalletes creates continued platform enabling wide range of activities. For upcoming realization was organized summer school - I love urban intervention - happening 16th - 20th of September 2013. Summer school wasnt just about realization of project, but was a simulation of architectural work, consists from creation of program, marketing strategy and media. 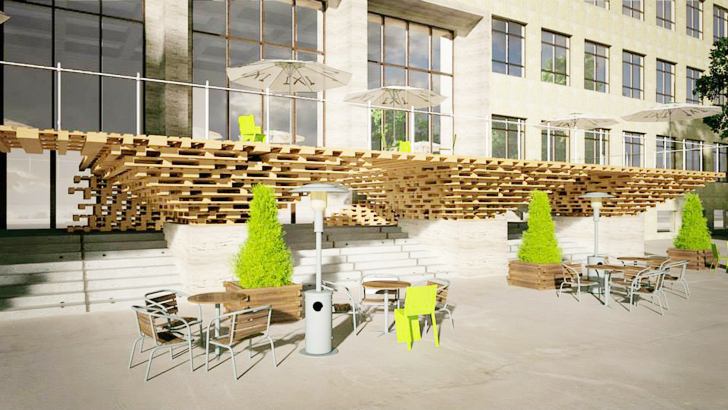 1x1 pavilion will served as catalyst of public space, opening with music festival 24th of September 2013. Consequently in one month pavilion will serve to students and to public bringing wide range of activities. For example streaming a movie of Koolhaas houselife and Human scale, University market, where students from various faculties can acquire needed books, various discussions about theme as temporary architecture, communities in public space. In the same time pavilion is a challenge for potential people interested in using a pavilion. The project 1x1 will be housed at the pavilion. The program was initiated in winter 2010 as a pilot program launched by the Faculty of Architecture STU in Bratislava. A series of events will include lectures by leading European architects, discussions on current topics in architecture, and workshops and internships in renowned architectural offices. The structure was inaugurated at the music festival on 24th of September.